I totally get the mentality of wanting to keep certain details of your business private. We face privacy issues quite often because we offer bookkeeping services for small business owners. When dealing with sensitive information, you want to be sure it is protected. At some point though, you are going to have to let others into the sensitive areas of your business and here is why. I feel that many people don't want to let people into their business because they are afraid to show them the real story. Businesses that appear professional and super successful can sometimes be a nightmare of disorganization behind the scenes. Examples of disorganization include: the lack of a business plan, no formal procedures or processes manual, the lack of an organizational chart, and a bookkeeping system that is either non-existent or has not been updated in a long time. Don't be afraid of showing someone the real story of what is going on with your business behind the scenes. Taking your mask off and seeking help or advice is the first step in resolving the problem. If you don't show someone your true business, they will eventually find out the real story anyway when you fail. Business owners who really do need help are often too embarrassed to seek assistance. They are afraid that if they ask for help, they are admitting defeat or stating that they don't know what they are doing. Seeking help does not mean failure, it means you are human. Nobody is good at everything in a business. Those who believe they are the best at everything typically run their business at a suboptimal level. You don't know what you don't know and faking it leads to failure. Great business owners admit to what they aren't good at or don't enjoy doing. Finding help with or outsourcing your business weaknesses is a sign of a seasoned and successful business owner. Don't be ashamed to seek help with your business weaknesses. One of the biggest advantages of letting someone in on the real story of your business is to gain a different perspective. There can be a big difference between an internal and an external perspective. If you let an internal employee in on the details of your business, it can certainly help. Your employee can be a valuable resource to bounce ideas off of, especially if they know the real behind-the-scenes story. My only problem with internal perspectives is they can often be influenced by what your employee thinks you want to hear. Outside consultants will often give you the real deal, third-party perspective. This perspective can often be much more valuable than an internal point of view. The big drawback with outside viewpoints is that if they don't know you and your business very well, they may not be giving you the best advice. In the end, I feel that letting other people into the real story of your business has many more advantages than drawbacks. If you are getting good advice, you should be able to grow your small business quickly and in a more productive manner than taking everything on yourself. Seeking help with certain aspects of your business is not a sign of weakness; it is a sign of a business savvy owner. Admitting that you need or want help with certain aspects of your business is the first step. 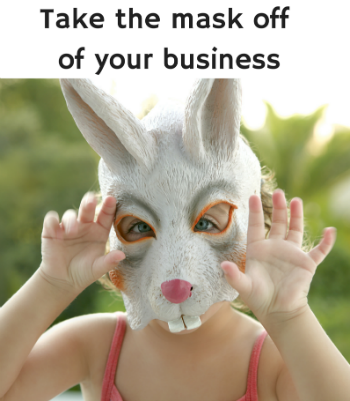 Take the mask off of your business and grow it to a whole new level. Have you ever let anyone "in" to your business? Did it help or hurt?